Today’s guest post is from Kaloud “Kay” of A Crafty Arab. I first learned about her site several years ago when few bloggers were talking about Ramadan. She is a Libyan American artist who creates art to promote a positive image of Arab culture. I have to admit I’m not nearly as creative as she is when it comes to crafts but am always inspired to try something new with the kids when I visit her site. Today she’s sharing a Libyan recipe for sharmoula. If you’ve ever wondered “how different can Arabic really be from country to country” this is a great example. In Morocco sharmoula (or charmoula) is a marinade with completely different ingredients than shown here. This dish might be called taktouka in Morocco, and shakshouka in Lebanon and Israel/Palestine. So yes, it really is THAT different! 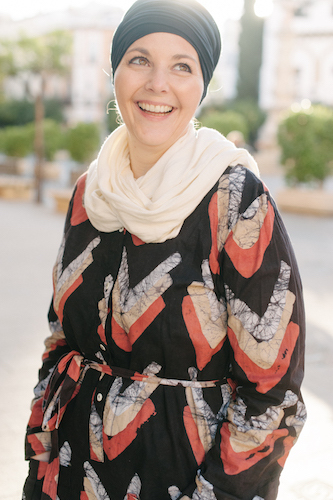 Follow Kay on her site for updates on the Ramadan challenge as well as Facebook, Pinterest, and Instagram. Enjoy! 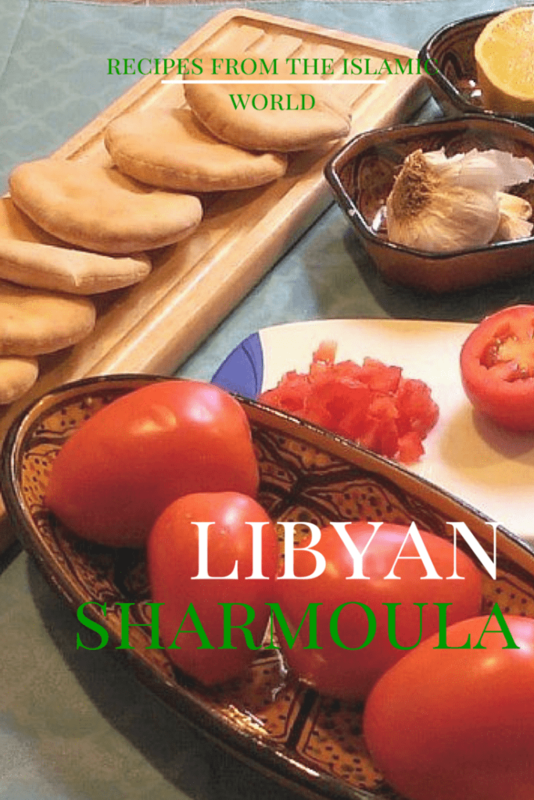 Libyan sharmoula is a close cousin, twice removed, of the Italian bruschetta. Considering Italy’s colonization of the Libya people in the early part of the century, there are many dishes that have a heavy influence from our conquering neighbors up north. And yet, many of the dishes had to be adjusted to local growing vegetation by the Amazigh and Arab tribes that lived in the dessert, mountainous and coastal regions of Libya. Traditionally sharmoula is eaten by scooping it’s deliciousness with pita bread, or French bread. 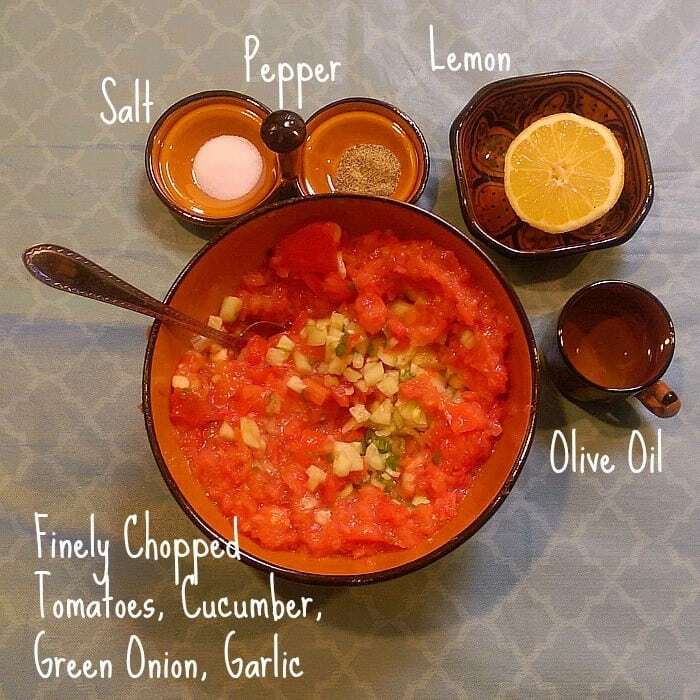 And like most Libyan food dishes that are eaten by hand (bazen, asida, etc) it is a shared family meal, although if you are a guest in a home, you may request a spoon. Sharmoula is usually produced by the youngest members of the family who are just learning how to prepare meals. It only has a few basic ingredients that can be found in most refrigerators and takes hardly any time to prepare. It can be eaten alone as a meal, or to compliment a rice or cuscus dish, and you will find it a staple at most Libyan meals during Ramadan. My two older daughters make it for us in the summer from the tomatoes in our garden, keeping the tradition alive of when I would collect tomatoes from my jaidie’s (Libyan for grandfather) home garden. 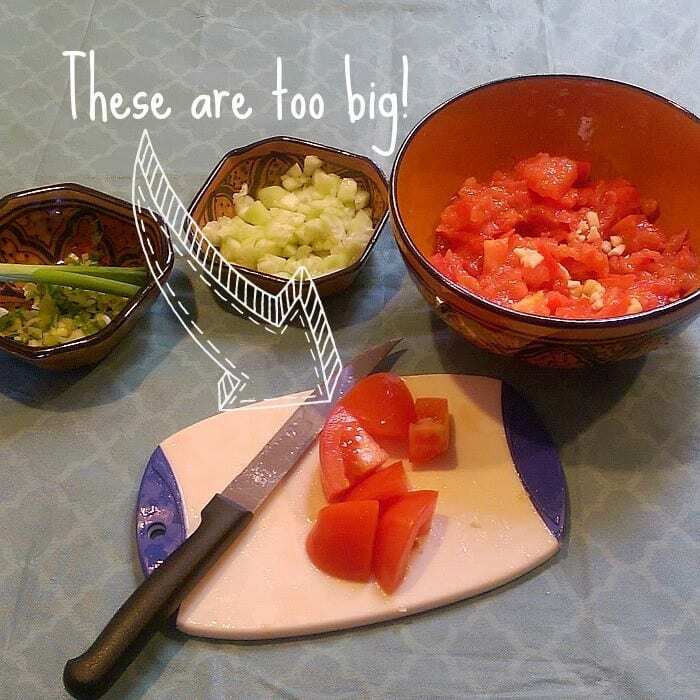 Cut the ripe tomatoes into very small pieces. Then cut them smaller. You can also use your fingers to mash them; just make sure the pieces become fine. Having spent most of my childhood chopping sharmoula tomatoes nightly, the significance of the tomato pieces being tiny can not be stressed enough. If the pieces are too big, they will be harder to scoop later with your bread. Plus it adds to the texture that is so vital to North African cuisine. Also cut the green onion and cucumber and garlic into fine, small pieces. Add the salt, pepper, olive oil and half a lemon to taste. It’s traditional to add jalapenos to Libyan sharmoula to spice it up a little but I’ve made it optional here. Another idea is to cut it up into large pieces that can be picked out, but you’ll still get the spiciness of the flavor. I hope that when my eight year old is a little older, we can start adding it to our sharmoula too. If you do add the onions and/or olives, make sure they are also cut into small, fine pieces. Hello! I’m just discovering your blog and I love it. I’m wondering if you would recommend using the food processor to get the vegetables into fine pieces or stick to a knife. I would just cut things so that then you get a good texture or it will be too mushy. Enjoy!